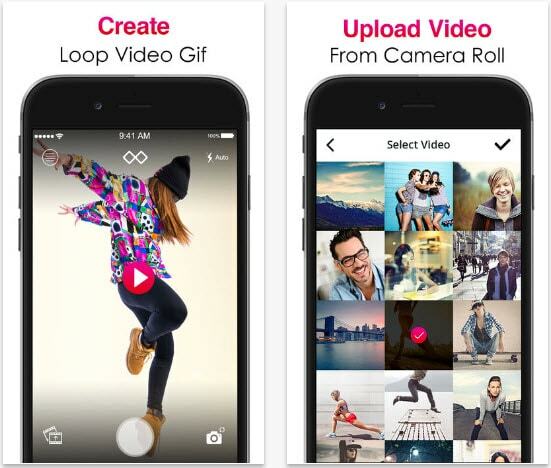 Convert Photos and Videos to GIFs easily and quickly. The rise in popularity of websites like 9GAG and Imgur has largely contributed to the widespread of GIFs on social media. These short and funny animations often convey messages that make us all laugh and they often feature movie superstars, celebrities, and even animals. It is safe to say that GIFs have become an integral part of our mainstream culture. If you would like to record or create your own GIFs from images on your camera roll, we recommend these GIF apps for iPhones. A unique GIF that uses an authentic material has better chances of becoming a hit on social media, which the reason why all aspiring GIF makers should install Giphy Cam on their iPhones. 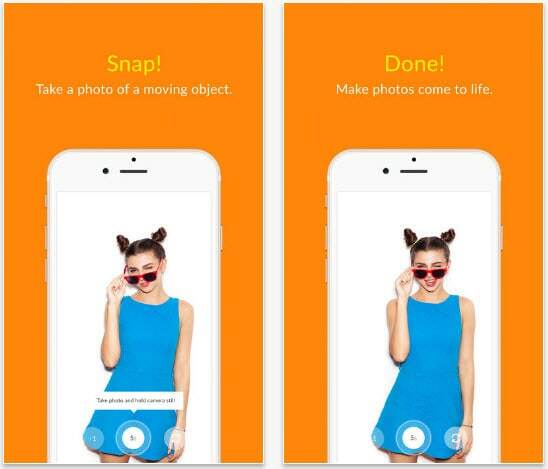 This app lets you record a GIF, take a 5-frame burst or use images from the camera roll. Furthermore, the app's users can apply an endless amount of filters to their GIFs since new filters are added every week. Adding text to a GIF with Giphy Cam is also very easy, but iPhone owners that have an older version iOS must upgrade to at least iOS 10 in order to use this app. 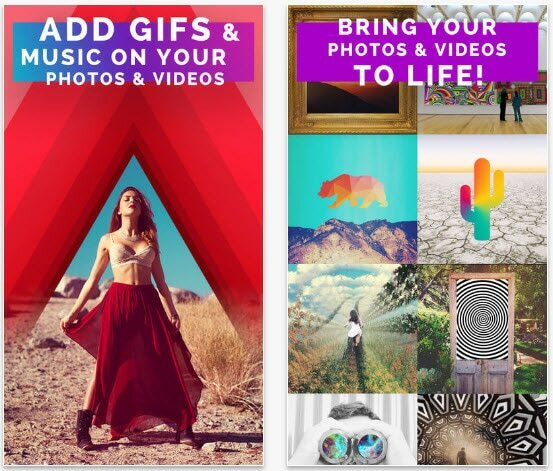 This iPhone GIF maker is free and it doesn't contain in-app purchases, but the amount of options it provides is scarce. Its users cannot capture new images and they must use footage that already exists, which limits the creative output of the GIF maker. However, the process of creating a GIF with GIF Toaster couldn't be simpler, since all you have to do to create a GIF is select photos or a video, adjust the encoding options and tap on the Start Encoding button. iPhone owners that have iOS 9 or any later version of the iOS can use this app to create GIFs from live photos. What's more the ImgPlay GIF Maker enables you to record your GIFs with the Camera mode or even import a GIF from Dropbox, GoogleDrive or iTunes. 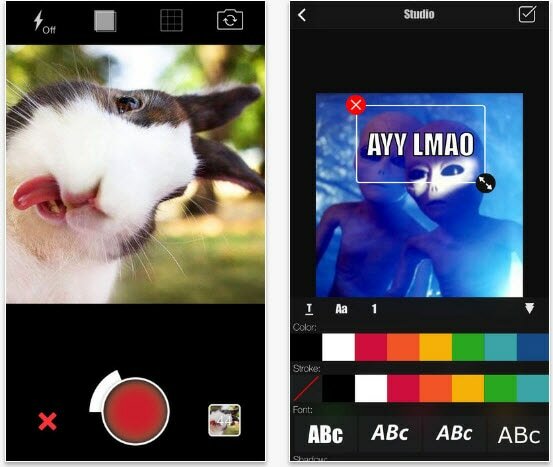 Adding captions or applying filters is also made possible by this iPhone GIF maker, while its users can also control the frame speed or set the frame playing direction. ImgPlay GIF Maker is free to download, but its pro features must be purchased. 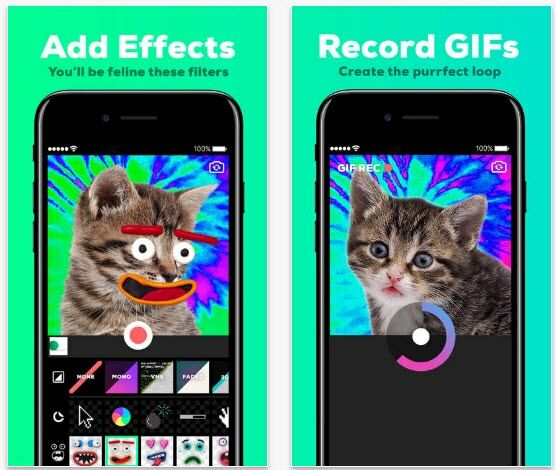 Whether you want to capture new footage or use the video that's already on your camera roll, this iPhone GIF maker will help you create funny high-quality GIFs. Users of this app can choose which part of the video they want to convert to a GIF file and set the speed of the GIF's loop. This GIF app for iPhones doesn't provide video or photo editing options, so if you'd like to edit the footage you want to use in your GIF you should do it before you utilize this app. Even though the Videos in to Gifs app can be downloaded for free, purchasing the GoPro feature might help you create better GIFs. If you consider yourself to be a fan of the Boomerang app, then you are going to love using LoopVid, because it enables to capture goofy videos. The length of the video can vary from 1 to 9 seconds and the app creates an endless sequence that is perfect for capturing motion, falling objects or anything else that has a repetitive rhythm. LoopVid isn't really a GIF maker, so features, like adding text or importing footage from your camera roll, aren't available and the number of ads that pop up when the app is open might be frustrating. This amazing iPhone GIF maker lets you create a collection of memes and GIFs on its camera roll, and it is incredibly easy to use. The app's GIF camera enables you to record frame by frame or 12-second videos, while you can also add amusing captions, apply visual effects or adjust the GIF's playback speed. If you'd like to make a GIF from the footage that already exists you can easily import it into the GiF Forge and play with it in any way you want. In addition, this iPhone GIF maker lets you share GIFs to any social media network you can think of. The Video to GIF app is free, but if you want to remove ads, you must make an in-app purchase. Ads are probably the only thing you won't like about this iPhone GIF maker since it allows its users to make a GIF from virtually anything. 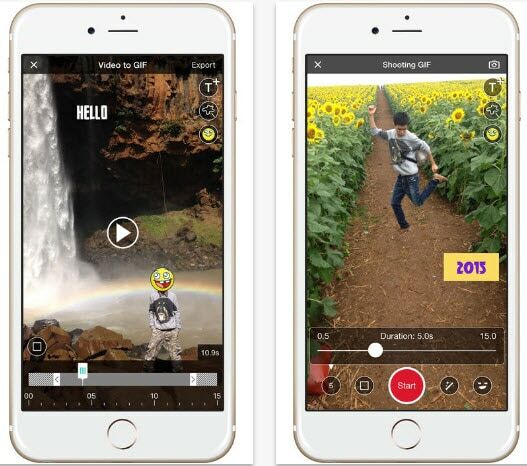 YouTube video, your own content or Live Photos can all be used to create brilliant GIFs. The app also allows you to use animated text in your GIFs, which is a great option if you want to create GIFs that will draw a lot of attention. 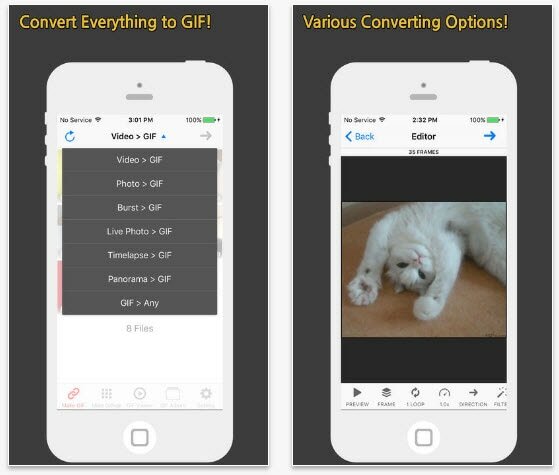 The users of this GIF app for iPhone can get an URL and share their creations wherever they want. Even though the free version of this GIF app for iPhone provides more than enough features to create awesome GIFs, removing the watermark or unlocking all features must be paid for. GIF X provides over 300 effects that can be applied to videos and photos and more than 200 masks that can be used to customize GIF effects. Adding music to GIFs is another remarkable feature offered by the GIF X app, but you must import the photos and videos from your camera roll or download them from GIPHY. As its name suggests this iPhone GIF maker is a genuine laboratory that enables its users to create funny selfies or good old-fashioned GIFs. 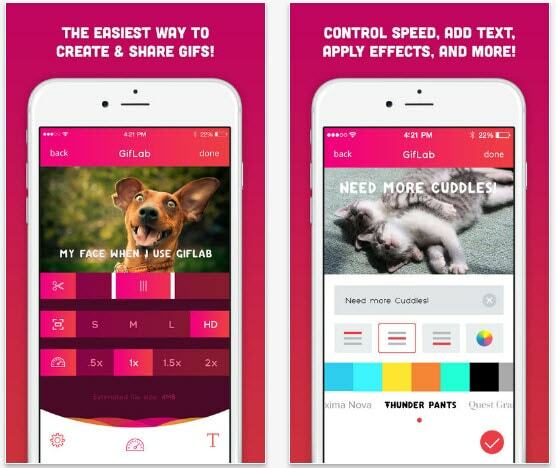 Each GIF created with GifLab can be converted to video and shared on Instagram or easily shared anywhere else on the Internet. This GIF app for iPhone lets you add captions, apply filters and choose the speed and the quality of a GIF, but it doesn't provide any tools for capturing photos or videos. Furthermore, GifLab is the only entry on this list that cannot be downloaded for free. 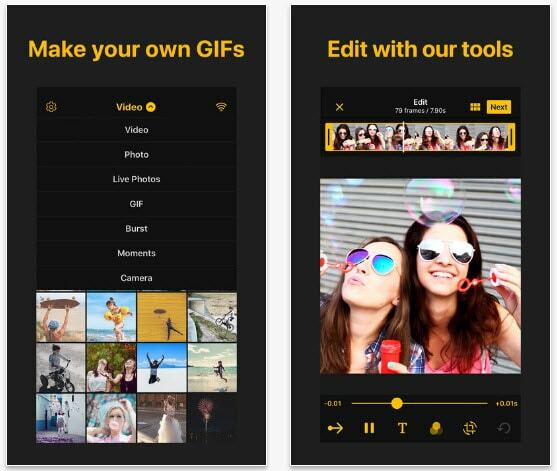 The list of features provided by this iPhone GIF maker is stunning since a quick look at it leaves you wondering if there is anything this app can't do. 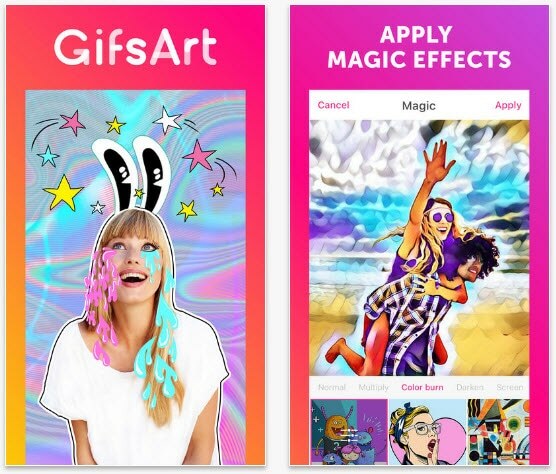 Its users can use any kind of media to create their GIFs and what's more PicsArt GIF & Sticker Maker offers a long list of GIF effects and animated masks. The in-app camera allows you to record videos or take photos in burst mode while downloading content from Giphy is also an option. The huge library of fonts makes adding text or captions to GIFs a lot of fun and it contributes to a strong impression this app leaves on all of its users. However, if you want to make a GIF online, Filmora meme maker is your ultimate solution. It helps you make image, GIF and video memes directly without watermark. It is totally FREE to use and no sign up. You can change text size, color and position to create caption when you are editing. You can also put text inside or outside in GIF. Just with a few clicks, your GIF is done. Try it now!